Can't find the rest of the photos of swap hexies - they gotta be around somewhere. I'll post them when I find them. I joined a pot holder swap and this is the one Michel made for me. And this is the one I made for MAry. 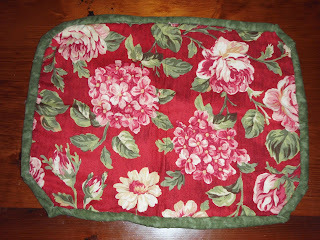 I also joined a tuffet swap -a tuffet is a fancy name for a pincushion. Here is the one Donna made for me - isn't it pretty. And the one I made for her. This was made form one of my bags of fabric scraps - I am going to make quite a few of these up for the birthday box. One I made for Sue. One I made for Barb. I think I have put a pic up earlier of the one I made for Linda in January.